Felicia was in shock and very surprised when she saw me holding a bouquet of white lilies at the door. You can almost see the "big question" mark on her face. I gave her the flowers and a hug. She was petrified and not sure what was going on. Haaa…I bet in her head, she was scanning millions of data for answers. Well, it is neither her birthday nor our wedding anniversary. It was just another "24th" day of the month. Felicia and I began our fateful journey on 24th Nov 1993. In those days of puppy loves, we have absolutely no idea how long we are going to last. From the very beginning, we were counting and marking our togetherness by months. I have made a promise to myself that I will walk this journey with her as long as we can. On our 1st "Bobojojo" day, I made her a hand-drawn cartoon card. Since then, we have been wishing each other love on every 24th of the month. We were married on our 100th month in Singapore. That day was 24th March 2002. For the next 99 months, we entered another new phase of our life. Life was very exciting and blissful. I am getting fatter and Felicia is getting prettier. In 2004, Elkan was born and he changed our lives drastically. Felicia and I were also separated for almost 1 year when I moved to work in Shanghai in 2006. By mid 2007, Elkan and her moved and joined me in China. Since then, we have been living abroad – moving from Shanghai to Hong Kong. This May, I realised our 200th month will take place on 24th July 2010. Over the last 199 months, Felicia has been sending me sweet note (on every 24th day of the month). I want to give her a sweet surprise this time. Finding a right present for Felicia is extremely difficult. Over the years, I have given her the same old boring list of gifts – watches, bags and jewelry. I wanted to plan another "surprise holiday" for her but my workload is extremely heavy this period. Tracy suggested that I cook for her. Well, after my last kitchen disaster in Shanghai, I have told myself not to enter that place again. Lately, I have seen Felicia playing on her iPhone. Every night, she spends hours surfing FACEBOOK or reading articles / recipes on that little small screen. I have decided to give her an iPAD. Problem is: It is not officially launched in Hong Kong. (The water goods cost 50% more!) Lady Luck was shining on me! 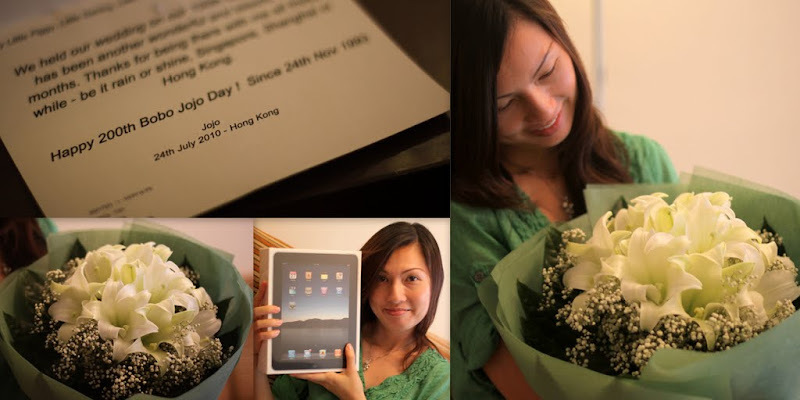 Last Monday, Apple announced the launch date of iPAD in Hong Kong on 23rd July! By sheer luck, I managed to get 1 for her yesterday! When Felicia finally read the message in the card and saw the gift, she smiled at me and whispered. "I was really surprised. I didn’t know you were counting…Dear…I don’t need such expensive gift. I prefer your cooking." It was a sweet and lovely moment. And then, my expression changed and I gave her that prankster Joe-Look – "Okay… Now, where is my surprise present?" No present, she said and left. And then, Elkan pestered "Huh? You mean today is Mummy’s birthday? No? Then why she has an iPAD gift? What about me leh? Hmmp! Not fair!" Heee…Life is back to normal again. I can’t cook anymore. So need to be more "romantic" in other areas. :)MC, what is your wife’s number? Haaaaaa…. Wahh..!!!!!!! Now I need to learn from you on how to be more "romantic" liao.. if my wife is reading this, she’ll start questioning me! Thanks lor..